Or is it accommodating confrontationism? I guess it depends on the image you wish to portray. I have followed the accomodationism vs confrontationism (or “new atheism,” or “gnus”) debate among US atheist and science bloggers with interest. Mainly because I think it is relevant to the question of the relationship between science and religion, and the current changes in public acceptability of non-theism. On the “confrontationist” side there are bloggers like PZ Myers, Jerry Coyne, Eric Macdonald and Jason Rosenhouse. Also authors like Daniel Dennett, Sam Harris, Christopher Hitchens, Victor Stenger, Ayan Hirsi Ali and Richard Dawkins. They are vocal and unapologetic about their atheism. Rejecting the idea that one should not criticise religion because it is “disrespectful” and that religion therefore has a “go home free card” not available in other areas of human discourse such as politics, sport and science. Generally they will assert that there are basic epistemological differences between science and religion and they should not be conflated. The boundaries are stark and should be clear. Science should be honest and uncompromising about evidence and conclusions and not feel it has to accommodate religion or superstition by giving lip service to it. On the “accomodationist” side there are commentators, journalists and bloggers like Chris Mooney, Micheal Ruse and Josh Rosenau. Others such Massimo Pugliocci at times advance at least some of the accomodationist arguments. Accomodationists generally argue that the “new atheists” are too confrontational. That their insistence on talking about their atheism and the problems of relgion isolates the US public. Their confrontational language is offensive to the religious majority. It doesn’t win friends and in fact is turning people away from science. Scientists, and atheists, should go easy on religion, never confront it, even make concessions to religion, in the interests of winning public support for evolutionary science and science in general. If anything the “new atheists” or “gnus” should STFU – leave the defense of science and evolutionary science to religious scientists. One of the latest discussions of this issue took place on the podcast Point of Inquiry recently where Ronald A. Lindsay interviewed Chris Mooney. (See Chris Mooney – Accommodationism and the Psychology of Belief May 09, 2011.) It’s a good-natured discussion which I found useful because Chris does clearly present his arguments. Chris stressed that humans are not rational. Our decision-making involves a lot of emotion. Consequently clearly held convictions are not easily changed. In fact the may become even more recalcitrant when exposed to rational discussion, evidence or criticism. I agree with this – and it isn’t new. It’s an important consideration for the presentation of arguments and participation in discussion. However, Chris uses this to justify his opposition to any “confrontational” opposition to religion. Even to the independent presentation of atheist world views. Influence of a public atheist presence. Chris made a concession on this point, referring to recently published research indicating that there is less opposition to atheists in environments where they already have a public presence. So he was effectively conceding that the public consciousness raising undertaken by “new atheists” and their encouragements to atheists to be public about their ideas, is having a positive effect. This was obvious to most people even before the research results were published. But it does expose the accomodationist request to atheists to STFU as basically counter productive. I can understand it from religious apologists hostile to atheism – but not from atheists themselves. The US population is turned off science by atheists? Chris is convinced this is happening in the US, but acknowledged he doesn’t have data to back up his conviction. He suggests than it would be very difficult and expensive to get that data. However, I discussed this in my articles Myths within a myth and Is atheism bad for science? where I commented on Elaine Howard Ecklands use of polling data to support a similar assertion. But in fact the data does not support this argument (See figure below from Is atheism bad for science?). If anything the vocal presence of “gnus” since the mid 2000′s seems to have undermined respect for religious leaders! With no obvious effect on the respect for science! Certainly no negative effect. %age of US public considering professions of "very great prestige." I think Chris is confusing the different tactics which are suitable for different situations. I agree that confrontation is a bad tactic when used at the personal level. In the one-to-one or small group situations ideas are advanced better if their presentation does not anger the receiver. In such situations one should seek the common ground and use it to advance one’s ideas. Of course this does not mean dishonesty or denying one’s own world views. Not at all. But this is not the situation Mooney is criticising. He attacks the talks, articles and public appearances of Richard Dawkins. He criticises the blog articles of PZ Myers and Jerry Coyne. These are not one-to-one or small group situations. These are communications with the public at large. They are part of public discourse. Contributions to the overall market of ideas. Atheists have a responsibility to communicate their ideas. Just as do theists, agnostics, Buddhists, etc. It’s part of contributing to the overall market of ideas and human thought we find so interesting. The fact that some people don’t like some ideas in that market is not a reason to prevent contributions. Similarly scientists have a responsibility to communicate their findings, and to be honest about them. Research results should not be hidden because they conflict with the beliefs of some people. Historians should not deny the truth about the Galileo affair just because it offends some religious sensibilities. And philosophers should not hide or confuse the fundamental epistemological difference between science and religion just to protect the sensitivities of religious fundamentalists. It’s important for non-theists and scientists to contribute their ideas to the general market because many theist activists promote misinformation about these, consciously or unconsciously. For example the vilification and misrepresentation of non-theists like Richard Dawkins. This might be intentional or it might just be an emotional response to his criticisms. But the concept of Dawkins being a “militant,” “strident”, “fundamentalist” atheist is promoted. And it gets picked up by people who should know better. By some non-theists, even those in academia. (Although the latter might just be examples of a common professional jealousy). And, such ideas can easily be assumed by those who have no other source of information. How often have I heard Dawkin’s books denounced by people who have never read them. Accomodationists commonly vilify Dawkins, Hitchens, and other “gnu” authors – often simply repeating the complaints of religious apologists. Of course this must be challenged. However, the more people who are familiar with the writings of people like Dawkins, or view them on internet videos, or hear them in person, the less believable such vilification and misrepresentation is. However, there is a more serious way that theistic idealogues will spread misinformation about atheism and science. Currently religious apologists question the epistemological basis of science – complaining that it does not permit supernatural explanations. This only has a small influence among accomodationist non-theists, but even so it can lead to a slightly post-modernist questioning of scientific epistemology among some academics. This also occurs with the history of science. It always amazes me how many theologians and religious philosophers pontificate in this area. And of course their pontifications are revisionist in the sense they attempt to rewrite history to express a Christian chauvinistic viewpoint. Science is a non-sectarian, democratic and inclusive enterprise. In recent years religious apologists have tried to rewrite the history of the Galileo affair to present religion in a better light. Or they may claim that scientists and atheists are misrepresenting that history. For instance they will claim that atheists are actively promoting a myth that Galileo was tortured and imprisoned. He wasn’t. although he was apparently threatened with torture and his sentence of imprisonment was changed to house arrest for life. But check it out. There are plenty of unreferenced instances of this claim being made by apologists – bit I certainly can’t find anything substantive to support the claim. Its a myth about a myth. Similarly apologists claim that a so-called “conflict thesis” is being promoted. Atheists are claiming that science and religion are inevitably and always have been in conflict. Of course no-one is saying that. There are inevitable and irreconcilable difference in epistemology, but historically the history of the relationship between science and religion has never been that simple. Apologists will rely on cherry picked quotes from old books like John William Draper’s History of the Conflict Between Religion and Science published in 1878. But this is disingenuous because it is easy to find other quotes in this book giving examples of the positive role that some religions have sometimes played in science. Is the US a special case? Sure there are sensitivities in situations where atheists are a small minority like the US. But this is not the same issue in Europe or New Zealand. In fact these examples indicate the real nature of the problem. 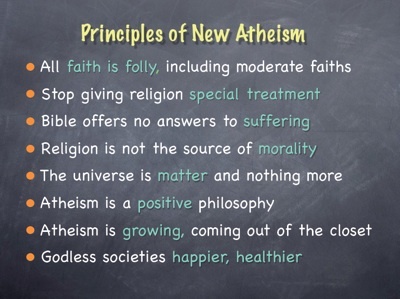 In New Zealand the vocal opposition to “new atheists” really only comes from the committed anti-atheist. The religious apologists. Those are the very few people who are strident or militant in their criticism of atheist adverts, or the appearance of Richard Dawkins on TV, or Dawkins lecture tour. (Boy, do they have an obsession with Dawkins and the “gnus”). While I am sure that some people like Chris Mooney and Michael Ruse do exist in New Zealand they really don’t comment much here. The accomodationist/confrontationist debate is very rare. Then again, perhaps there should be such a debate here. Perhaps atheists in New Zealand are not “confrontational” enough. Perhaps they should be doing more to counter situations like non-consential prayer, promotion of creationism, religion in schools, etc. After all, these are all issues non-theists have important views on and they should make sure that these ideas are part of our society’s appreciation and knowledge. Maybe our atheists are not living up to their responsibilities? When you’re working with students I do think you need to be careful; as you say, strong, overt opposition to a set of beliefs may only entrench them further. With my students I want them to examine their own understandings without putting them in a place that’s so uncomfortable that they don’t want to go there. I don’t think that’s accommodationist but it does give them space to think without being threatened, which is important as there’s already a power imbalance in any classroom. Religion has never been “accomidating” to anyone outside of their dogmatic circles, but especially not to non-theists. Responding to them via accomidation doesn’t win them over. In truth, I have converted more theists over to non-theism via confrontationalism than I ever did being accomidating and gentle. Theism is a prejudice just like any other. And the only way to fight prejudism is head on, with reality and facts, without any apology for the method or means in presenting it. I agree, Alison, there’s obviouysly a time and place as your example shows. In my experience, though, it has usually been the theist rather than the atheist who has promoted their ideas innapropriately in classes. oh, Alison. I look forward to that! Ken, yeah I think the importance of setting is often glossed over and there seems to be this implication that there is a “right” way to go about things. Applicable to all situations and all times (or maybe that’s just the strawman I carry in my head. he tells me things). That’s patently false. Let the example of Harold Camping stand as both a model of theo-scholastic ignorance pretending to understanding and a warning to all religious, of the very real ‘trap’ of self deception and the deception and exploitatiÂ­on of others. This very real potential to counterfeit ‘truth’ is innate to the religious quest. And the situation will remain unchanged so long as the ‘religious’ hold to a conception of ‘truth’ at odds with Enlightenment understanding of knowledge. The irony is that there is a great deal of scriptural material which fits the empirical model, but is anyone looking? The problem is that people think that atheists lack belief. the cause or what existed before can never be known. the purpose of life may be to enjoy the day and be kind. when I die it will be the end for me with nothing remaining except my ashes recycled by microbes. Whenever someone tries the “Christianity gave birth to science” approach, my standard reply is that “alchemy gave birth to chemistry/astrology gave birth to astronomy”. Even if science had originated from christianity that doe not require that christianity is a valid knowledge system. I agree that caution is required around religion when in the classroom, but atheism will flounder if we do not have those brave souls who will publicly challenge religion when it starts imposing its “morals” on society as a whole. Perhaps atheism has tended to function more reactively than proactively? It is strongest in countries where there is corresponding strong theistic organisations. Perhaps in NZ, with no obvious strong religious groups to oppose (apart from the occasional idiocy for groups such as Destiny) there are no significant issues for atheists to have to deal to? Perhaps in NZ we are just too laid back?